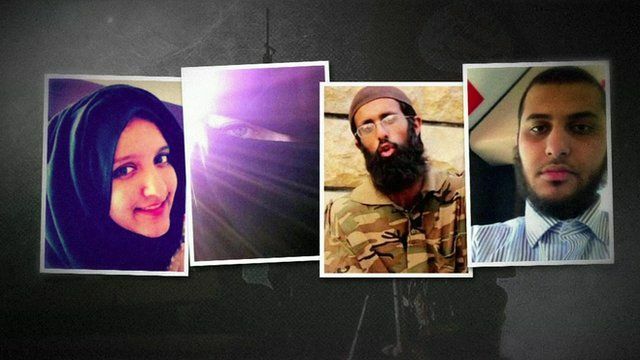 British jihadists face UN sanctions Jump to media player Four British jihadists fighting or recruiting for Islamic State in Syria are to be subjected to UN sanctions. 'Sorrow and shame' over IS daughter Jump to media player The parents of a Glasgow woman, believed to be in Syria, have issued an emotional plea for her to return home. Son 'may not appear' in Isis film Jump to media player The father of a Cardiff man accused of featuring in an Islamic State film showing beheadings says he cannot confirm his son appears in it. Anti-terror police 'doing best' Jump to media player The head of Wales' counter-terrorism unit denies that police are failing in their efforts to combat the radicalisation of young Muslims. Four UK nationals fighting alongside or recruiting for Islamic State militants in Syria are to be subjected to United Nations sanctions, at Britain's request. The two men and two women will be banned from travelling anywhere in the world and their assets are to be frozen.